In this sense property rights fuel the expansion of capitalism. They invite property owners to externalize costs on to those resources that ought to be treated as common property. Externalizing costs means using shared resources to the point where they are exhausted while failing to maintain or reinvest in them. The displaced costs are borne by the resources themselves, which are diminished and depreciated, as a way to boost profits. Thus property law encourages the opposite of sustainability. It promotes the relentless consumption of resources and thereby enhances capitalism. What we need is the contrary: to encourage sustainable ecological stewardship by reinvesting externalized costs, i.e., profits, into the preservation of resources. Such a legislative amendment is needed because present laws constitute a barrier to sustainable stewardship of natural resources, and a particular barrier to the task of commoning, Peter Linebaugh’s term for the self-determination of commoners in managing their shared resources (Linebaugh 2008). 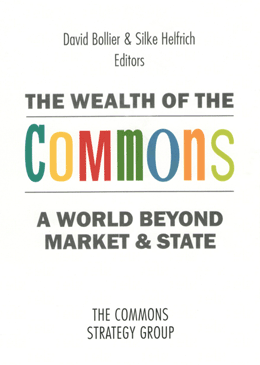 Without amending the law it would not only be difficult to create and manage local commons as exchange trading systems and complementary currencies (Lietaer and Belgin 2011), it would be nearly impossible to establish networks that manage the preservation of global resources as commons. Under current laws each single stockholder of a corporation can sue the management for having ordered investments in protection of the environment that go beyond existing law. Because corporations are so deeply committed – legally and economically – to make profits by externalizing costs, how could managers be persuaded to invest this profit into preserving the consumed global resources? It is impossible so long these resources are not acknowledged as common property. That prerequisite being accomplished (or anticipated), the next step must be to transform a resource into a commons. The German term is allmende, a word that once referred to any local community of free people that decided on their common affairs by their own right; common pasture, common wood were historically just the most recent forms of the allmende before it was disbanded (Grimm 1854). Today, in reviving the term allmende we mean a common resource alone, but also the community that manages it as a commons. This is what the term “commoning” means: Managing the resource as a commons, in other words actualizing the allmende principle – the principle that the community members moderate their demands on the resource by mutual agreement and mutual monitoring and enforcement (Scherhorn 2012, following Ostrom 1990). an evolving system of largely self-regulating fishery management, an evolution,, a series of experiments, that continues to this day.... It has three major developments: a self-imposed half-year closed season formalized in a 1907 state law; a self-imposed limit on the number of traps per lobster-fisher instituted in the 1970s; and, most recently, an unprecedented, state-sanctioned limited-access fishing regime for the island. The context is nearly two centuries of ever-increasing pressure on the lobster fishery along the Eastern seaboard of the US and Canada and the threat, realized in many places, of depletion and loss of livelihood (Princen 2005). Encyclopedia Britannica, “Montreal Protocol,” available at http://www.britannica.com/EBchecked/topic/391101/Montreal-Protocol. Gerhard Scherhorn (Germany) was former director of the Academy of Economy and Policy in Hamburg and is professor emeritus of the University of Hohenheim where he gave lectures on consumption theory and consumer policy until his retirement in 1998. He directed the working group “New Models of Wealth” at the Wuppertal Institute for Climate, Environment and Energy from 1996 to 2003 as well as the research group “Sustainable Production and Consumption” until 2005. With Prof.